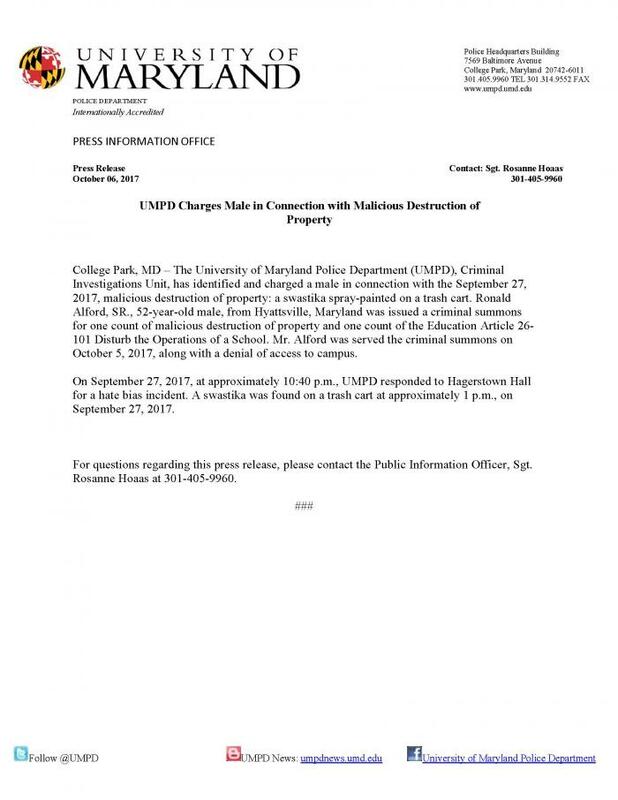 OCCURRED: October 6, 2017, at approximately 10:56 p.m.
On October 6, 2017, at approximately 10:56 p.m., the University of Maryland Police Department responded to the Stamp Student Union area for an assault involving a baseball bat. Two male UMD students were walking along Campus Drive near Stamp Student Union when they got into a verbal altercation with a passing vehicle. A male passenger got out of the vehicle and began following the two students. The passenger then went back to the car and retrieved a baseball bat. The passenger then exchanged words with the two students and then struck one of the students. The passenger then got back into the vehicle and drove towards Baltimore Avenue. The student was taken to a local hospital and has since been released. Our Criminal Investigations Unit has identified the two suspects involved in this incident. They have no affiliation with the University and were issued a denial of access for the campus. Charges will be filed. The 2017 Annual Safety and Security Report and Annual Fire Safety Report are available for your review. The Annual Security Report provides safety and security information to current and prospective students and their parents, as well as to faculty and staff members. Statistics comparing crime over the previous three years are outlined in the report. In addition to outlining the different security resources the campus has to offer, the report also includes statistics on area crime reported to off-campus law enforcement agencies as well as to several University departments that report data back to our Police Department. 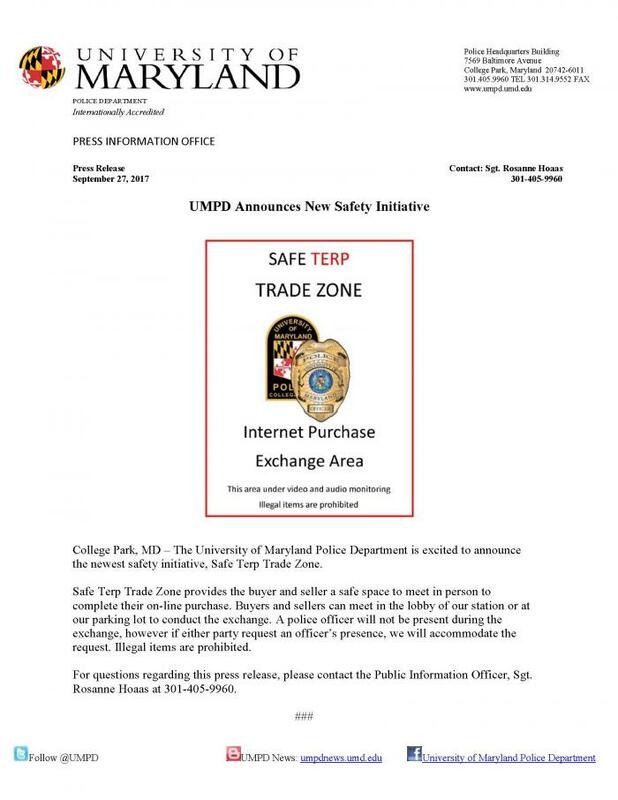 Printed copies of the Annual Safety and Security Report may be obtained from the University of Maryland Police Department (UMPD), Pocomoke Building (007), 7569 Baltimore Ave, College Park, MD 20742 (301) 405-3555 upon request. Although this publication mainly focuses on 2016, the murder of Second Lt. Richard Collins III in 2017 has called for the entire campus to come together in order to resolve differences and reaffirm the University’s core values of diversity, inclusion, respect, and civil discourse. The University is undertaking many initiatives aimed at promoting and protecting diversity within our community, including the launch of the Joint President/Senate Inclusion & Respect Task Force, the development of a trained rapid-response team for hate-bias incidents, and a review of the University’s Code of Student. For more information on how you can be part of the conversation and solution, I strongly encourage you to visit https://www.umd.edu/UMDreflects. 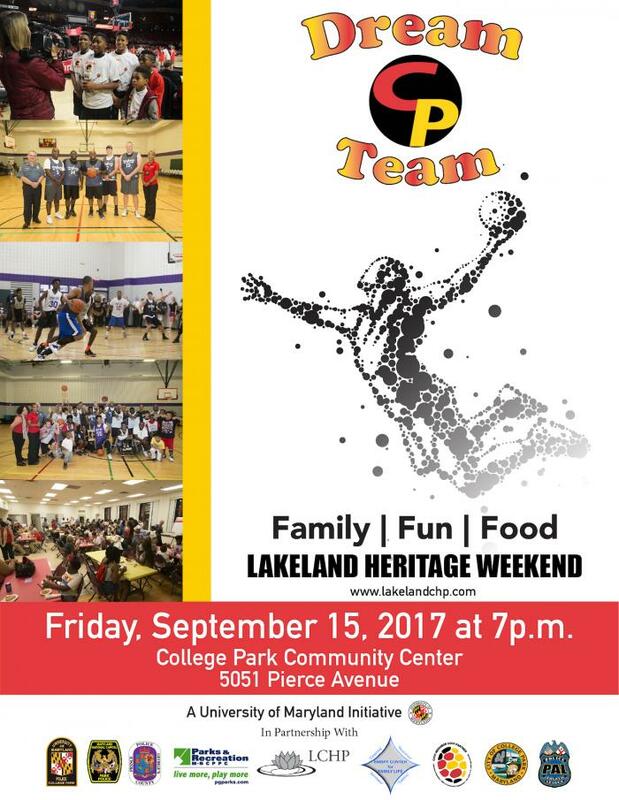 It is through our community that opposing ideals and values can come together to form one voice for positive change. We have no greater priority than the safety of our students, faculty, staff and visitors to our campus, but a truly safe campus can only be achieved through the cooperation of everyone. OCCURRED: September 5, 2017, at approximately 12:40 p.m.
On September 5, 2017, at approximately 1:12 p.m., the University of Maryland Police Department (UMPD) was notified of an incident that occurred along the Hiker/Biker Trail near the College Park Airport. Officers from UMPD and the Maryland-National Capital Park Police responded and met with a female. The female was walking along the trail when a male grabbed her from behind and forced her to the ground. Once on the ground the male got back up and left because people could be heard walking along the trail. No injuries were reported. The suspect was last seen riding a bicycle south on the trail towards Riverdale. UMPD notified neighboring police departments of the incident. Officers have increased their patrols along the Hiker/Biker Trail near campus. 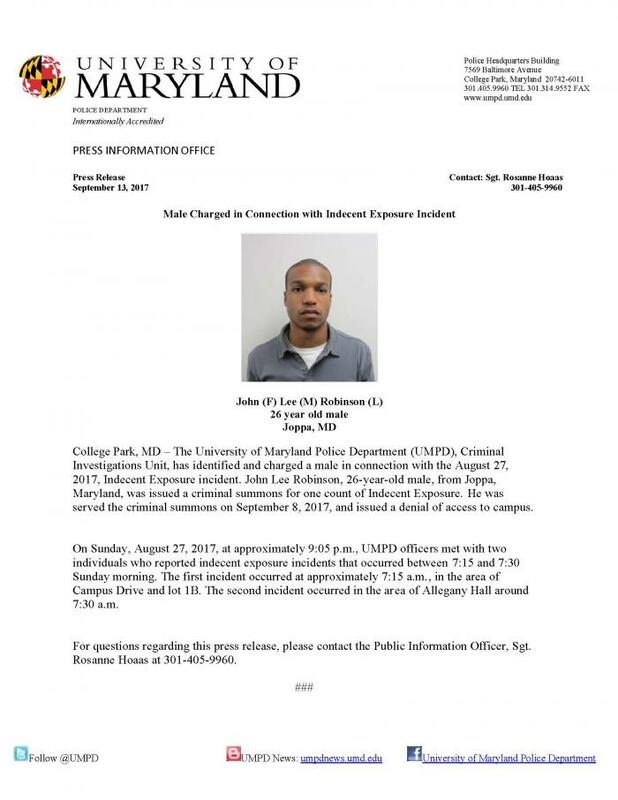 OCCURRED: August 31, 2017, at approximately 3:55 a.m.
On August 31, 2017, at approximately 4:03 a.m., the University of Maryland Police Department responded to Ellicott Hall for a burglary. Two female students were asleep in their room when one of them heard a noise. The student woke up and found a male inside her room who appeared to be intoxicated.‎ The second student woke up, yelled at the male, and he left. Officers searched the area but were unable to locate the male. OCCURRED: August 27, 2017, between 7:15 a.m. and 7:30 a.m.
Sunday evening around 9:05 p.m., UMPD officers met with two individuals who reported indecent exposure incidents that occurred between 7:15 and 7:30 Sunday morning. The first incident occurred at approximately 7:15 a.m.‎, in the area of Campus Drive and lot 1B. The second incident occurred in the area of Allegany Hall around 7:30 a.m. Both incidents involved a naked male who approached female UMD students. A video review of our cameras ‎is currently under way. Officers have increased their patrol presence around campus. The University of Maryland Police Department (UMPD) announced today an update on a hate/bias investigation involving a noose found on campus. On April 27, 2017, the University of Maryland Police Department responded to Fraternity Row #5 for a hate/bias incident. A noose was found in the kitchen, and UMPD launched an investigation. Our detectives have spent over 600 hours investigating this incident, including interviewing over 60 people, as well as reviewing video and swipe card access. UMPD has now referred a person of interest to campus officials for disciplinary review. Criminal charges will be applied should additional evidence meet the threshold for state or federal prosecution.